At AllSides, we admittedly have a general bias in favor of free speech and civil discourse. 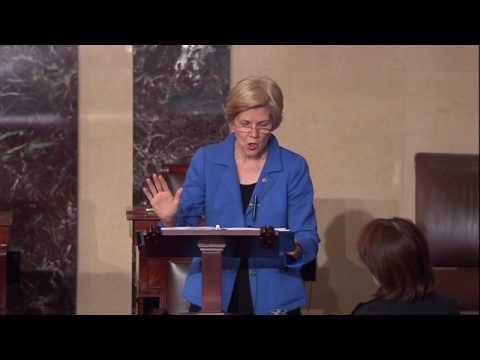 So what should we think about Elizabeth Warren's words on the Senate floor and the action to silence her? Senate Rule 19 started 115 years ago in response to a fistfight in the Capitol. Rules in the Senate and in the House are designed to avoid personal attacks to establish a level of civility. However, even though these rules are periodically mentioned to restrain behavior that may seem inappropriate, it is unheard of to use the rule to forcefully silence a Senator, as it was against Senator Elizabeth Warner this week. Many on the left were infuriated, pointing out other instances when the rule was not enforced and raising issues about race, gender and censorship. See other news featured by AllSides such as Obamacare Repeal in 2018?, Senate to Vote on DeVos, Jeff Sessions Confirmed, McCain and Trump Clash over Yemen and the latest AllSides News. "Warren's supporters saw a stifling of dissent, and asked how the mere reading a letter could violate the rule. It's a fair question: Can't a senator refer to the public record? But set aside her specific case for a moment, just to focus on the purpose of the rule. Rule 19 forbids an especially corrosive form of verbal combat. Granted, such a rule can seem hopelessly outdated in an era of acid remarks on social media. It can also seem like a needless luxury at this moment when the political stakes are so high. We all need a full and ruthlessly honest debate. If there was ever a time to avoid tiptoeing around the issues, that moment surely is now. But we also need civil debate. And in the Senate, lawmakers have learned to sting each other within Rule 19. If they have an insult to fling at another member, they simply disguise it as a compliment." "Senate Majority Leader Mitch McConnell will rue the day when he moved to shush Sen. Elizabeth Warren for trying to read a 30-year-old letter from Coretta Scott King critical of Sen. Jeff Sessions, President Trump’s nominee for attorney general. But put aside the partisan and gender optics of the gagging of Warren and the fact that the King letter was later read without incident by several male senators. Rule XIX, the rule designed to keep senators from attacking one another, was absurdly misapplied in this situation." 'In the House, when your words are taken down, you are prohibited from speaking on the floor for the rest of that legislative day and that's what they did with Elizabeth Warren last night when she went after Jeff Sessions in the way that she did. 'It maintains decorum and a certain level of civility if you can describe that as what's going on in the Senate today. But that is the objective of it.'"